Orsola Maddalena Caccia’s lavishly detailed painting The Birth of St. John the Baptist (1635), currently on view in Picturing Mary: Woman, Mother, Idea, features still-life arrangements nestled into the sacred narrative. A hallmark of Caccia’s oeuvre, these small renderings of food and flowers are imbued with symbolic significance. However, Caccia’s still-life embellishments are not only emblematic of the sacred story, but relate to a female viewer’s life experiences. This scene is derived from popular narratives of Mary’s life. The nativities of the Holy Family were often commissioned by and for women, and often depicted true-to-life rituals and objects that would have accompanied a woman as she prepared to give birth. Here, St. Elizabeth is sitting upright in bed after successfully, and safely, delivering her son. The baby, St. John the Baptist, is held near the painting’s center. His eyes meet those of the Virgin Mary, as fluted rays of light from the painting’s top left corner form a delicate halo. Almost every corner of the canvas is filled, advancing the narrative and alluding to Biblical themes. 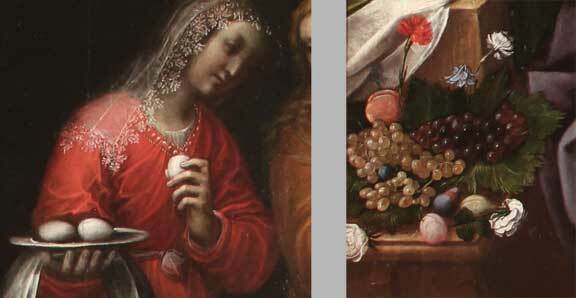 The piled bunches of grapes foretell Christ’s sacrifice and the sacramental wine of the Eucharist. Other small fruits are depicted as well: pears, for the sweetness of Virtue, and a quince, which had been associated with both immortality and fertility since Antiquity. The eggs held by Elizabeth’s attendants were symbols of birth and resurrection; their pale luster also resembles pearls, one of Mary’s attributes as well as a symbol of purity and virginity. The two attendants and their tray of eggs would also have reminded a female viewer of her own experiences within such a room. Childbirth in the Renaissance was a particularly dangerous experience, often accompanied by complications during and after the birth. The health of mother and child was an overwhelming concern. Renaissance medical texts were very specific about the necessary nutrition that a new mother required immediately after giving birth. Sweetmeats and nuts were brought to new mothers almost immediately after a baby was born. Poultry and eggs had long been especially recommended for women immediately after their labor. Even an exemplary figure such as Elizabeth required this sustenance; by including these staples, Caccia emphasizes the humanity of Elizabeth and John. Food is one of many theological symbols reminding viewers of the sacred nature of the scene. When shown alongside attributes of Christ and the Virgin, the nativity of St. John the Baptist acts as a precursor for the miraculous birth of Christ. Viewers at the time could also see Caccia’s painted details as a means of connection, meant to foster a bond between this sacred story and their everyday lives. 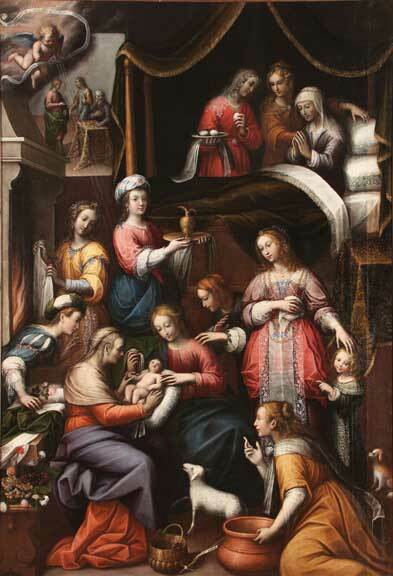 Visit NMWA to see Picturing Mary, on view through April 12, 2015. Click here to learn more! This entry was posted in Artist Spotlight, NMWA Exhibitions and tagged Orsola Maddalena Caccia, Picturing Mary by Women in the arts. Bookmark the permalink.